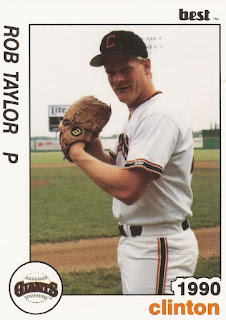 The Salt Lake Trappers were eliminated from the playoffs in this late-August 1989 game and helping eliminate them was Rob Taylor and the Pocatello Giants. Pocatello picked up the 6-5 win in 10 innings. Taylor got the win in relief, according to The Deseret News. Taylor went on to play in six more seasons, serving mainly in relief. He made AAA, but never the majors. Taylor actually is credited with two parts of career with three seasons in between where he is credited as not playing at all. The Maryland native is first credited as playing with the Brewers in 1984 at rookie Paintsville. He had 16 outings, four starts and had a 4.37 ERA. He returned for 1985, playing at rookie Helena. In just eight relief outings, he had a 6.43 ERA. Taylor then sat out the next three seasons, before signing with the Giants for 1989. He played that year at Pocatello. In 29 outings, one start, Taylor posted a 1.25 ERA and saved 10. He played 1990 between single-A Clinton and high-A San Jose. He had a 3.56 ERA over 44 outings. Taylor made it to AA Shreveport in 1991 and then AAA Phoenix in 1992. His first full year at Phoenix came in 1993. He picked up a win in an April game with two scoreless innings of relief. He spent another year at Phoenix in 1994, getting into a career-high 61 games. He also had a 4.62 ERA. An August scoreless ninth resulted in his fourth save on the year. For 1995, Taylor moved to the Cubs and AAA Iowa. In 54 outings, he had a 2.81 ERA. His 11th save came in late June. He got 18 on the year, but it was his final season in the pros.